There are currently no McMullin Area GSA GSP documents available for review. 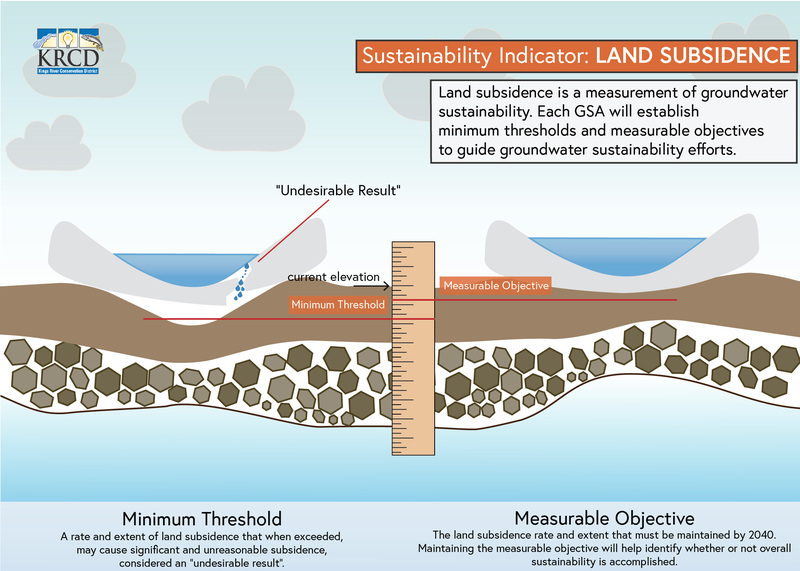 Best Management Practices, or BMPs, are defined by DWR as “the practice, or combination of practices, that are designed to achieve sustainable groundwater management and have been determined to be technologically and economically effective, practicable, and based on best available science.” The documents are a source of guidance for GSAs to develop GSPs that in their implementation, succeed in reaching sustainability. SGMA is complex. We’ve broken down concepts into video segments, infographics, and key terms. View the content below. Achieving sustainability under SGMA is measured using six “sustainability indicators”. 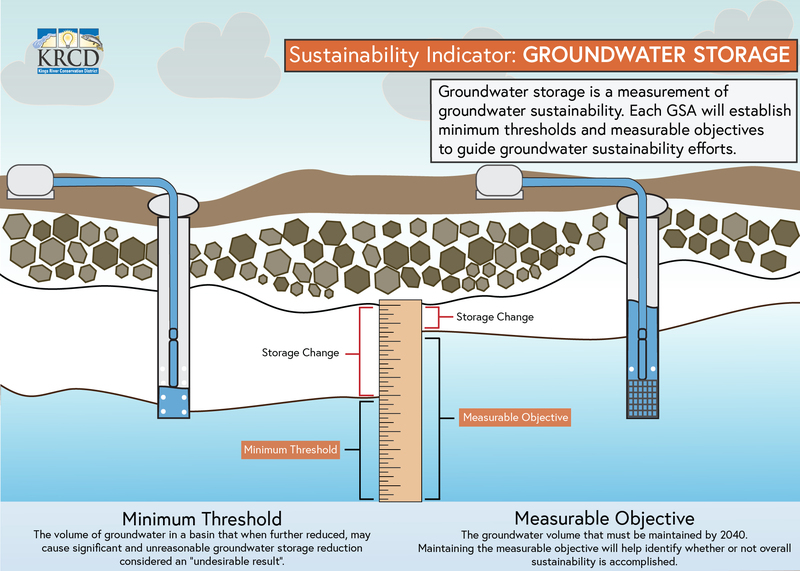 When groundwater conditions cause an undesirable result on any or all of the sustainability indicators, you are not sustainable. Achieving sustainability under SGMA requires avoiding undesirable results. 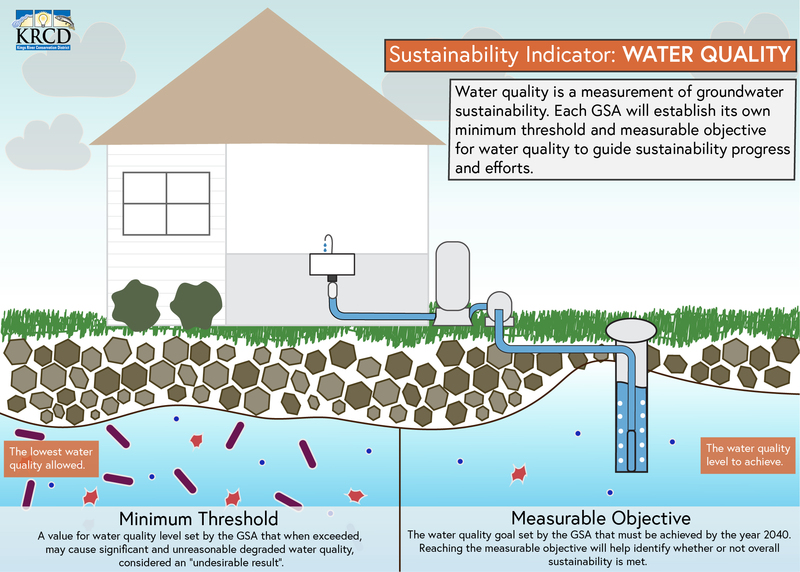 View the infographics below to learn how sustainability indicators guide SGMA implementation. Click images to view full size. A roadmap that specifies how the GSA will reach subbasin-wide sustainability. The Plan requires, among additional elements, a description of the Plan area, a hydrogeologic conceptual model, sustainability goals and objectives, a monitoring network, and projects and management actions to achieve the sustainability goal. In high- to medium-priority with critical overdraft conditions, GSP’s must be submitted to the CA DWR by January 2020. If deemed “probationary” due to failure to develop an adequate GSP, or failure to implement the GSP successfully, the State Board will allow the local GSA’s time to fix the issue that led to probation. If the GSA’s are unable to fix the issues, an interim plan will be implemented by the State. The interim plan will contain corrective actions, a timeline to reach sustainability, and a monitoring plan to ensure corrective actions are working. This kind of plan would include a fee structure and blunt corrective actions such as reduced pumping. if GSA’s are unable to develop an adequate GSP, or fail to implement the GSP successfully, the Board may designate the entire basin probationary. Anyone who extracts groundwater from a probationary basin must file an extraction report with the State Water Board. The State Board may require use of meters to measure extractions and reporting of additional information. part of a subbasin not within the management area of a GSA before July 1,2017. There are 7 GSA’s that cover the entire geography of the Kings subbasin, thus there are no areas of the subbasin considered an unmanaged area.